Gilles At The Grounds: Adelaide Showgrounds- Brick Dairy Building, Leader Street , Adelaide. 10am - 4pm. The Creative Lifestyle Market: Pant 4 Bowden, 3rd Street, 10am - 4pm. Oceanhaze Jewellery is now available at the lovely South Seas Bookshop and Trading at 53 North Terrace, Port Elliot. The Australian Refugee Association is celebrating their 40th Anniversary and I was honoured to be asked by Kirsten Bickendorf, CEO of ARA if I would donate some jewellery to their silent auction for their 'Our Table' event, February 20th. 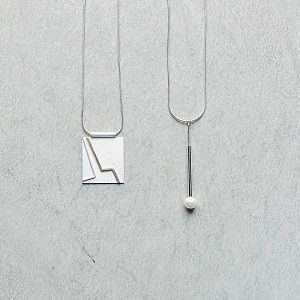 Sterling silver and 9ct Gold Necklace (left). Sterling silver and Natural Freshwater Pearl Necklace (right).